This beautiful flower blooms around St. Johns Day and has many wonderful properties. Used internally, St. Johns Wort is considered a remedy for mild depression, anxiety, nervous tension and mood swings. St. Johns Wort is often sold as a standardized extract however studies demonstrate the need for whole plant use to provide a more comprehensive bioavailability of plant chemicals. St. Johns Wort oil is also used externally as an anti-inflammatory for a number of conditions including sore arthritic joints, burns, sunburns and stings. When the fresh herb is steeped in oil, the oil turns bright red. Dry herb infused oil is not as effective due to loss of the active ingredient hypericum, which makes the beautiful red color. There is debate about whether St. Johnswort is effective as a dry herb, likely it is best fresh while the dry herb is still beneficial but less potent. The fresh and dry herb can be made into a tea. To use St. Johnswort year round preserve the fresh plant in alcohol as a tincture. St. Johnswort tincture is an excellent daily aid during winter time for Seasonal Affective Disorder. For wounds, combine oils of st. johns wort, yarrow, mint, plantain and red clover. We use the aerial parts of St. Johns Wort: flowers, leaves, stems. To make an oil infusion, use scissors or snips to cut the St Johns Wort into small pieces. Cover with olive oil, making sure all plant parts are covered. Cover and check daily to ensure that all plant parts are submerged, if they aren’t, use a knife to tuck them back in the oil. After about a month, strain the oil into a clean jar, cap and label. Oil then be combined with other infused oils and made into a salve. 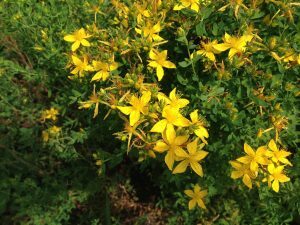 Cautions/Contraindications: St. Johnswort may cause photosensitivity in some so take caution especially during summer time when the sun is at its peak. Contraindicated in combination with some pharmaceutical anti-depressant medications.